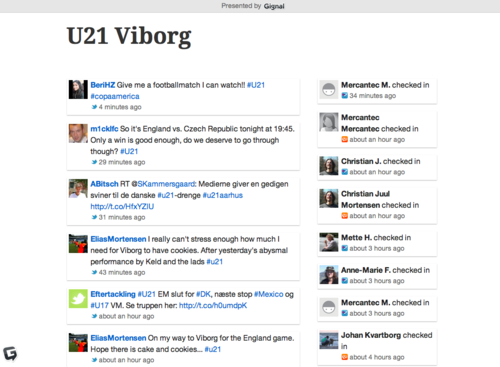 From June 11-25 2011 Gignal will present the social media buzz created by the audience in- and outside the U21 tournament venues. The games are played at different locations in Denmark, and the matches will be watched not only at stadiums but also in city squares and other outdoor meetup points. Gignal will capture the atmosphere and emotions when the audience posts updates on Twitter or Facebook, takes photos or video and check-in at the venues. Follow the Gignal from U21 on physical screens at the event or online.